Summit Financial Corp, an auto finance company in the Southeastern United States, increased electronic adoption for online correspondence and payments from zero to more than 70% in just twelve months. To be competitive in today’s auto finance space, virtually every company needs a web presence beyond a simple website. Modern consumers, particularly millennials, expect mobile self-service capabilities, alerts, reminders and a fast and easy way to communicate with their auto lender. Summit Financial Corp. (Summit) recognized the increasing need for an advanced online presence and engaged CEDAR to analyze existing business processes, customer communications, print operations, and payments. CEDAR’s professional services team was able to determine the main challenges that Summit needed to overcome in order to be competitive in the 21st century auto lending space. Without an advanced web presence, it was challenging for Summit’s customers to conveniently do business with them. Having no self-service payment options for their customers meant that Summit could only take Debit and ACH payments through the Call Center. Not only was this inconvenient for their customers, but it also negatively impacted Summit’s Days Sales Outstanding (DSO). Lastly, there was no standardization or templates for ad-hoc communications. Agents used MSWord to generate ad-hoc documents with no formal review, approval or retention process, causing disjointed creation, delivery and archiving of sensitive customer communications. 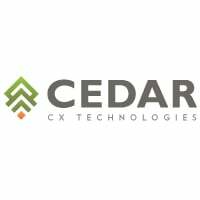 CEDAR worked with Summit to determine the Use Cases relevant to their current state and to define what was needed from a process and technology perspective to address the existing challenges. CEDAR re-designed Summit’s correspondence with a consistent look and feel to strengthen the company’s branding. Next, in partnership with Summit Senior Management, CEDAR created and implemented a public website for Summit Financial Corp. The goal was to deliver a simple, easy-to-use site that could take advantage of white space and exploit opportunities for online marketing. Finally, CEDAR added customer self-enrollment and customer account self-management and payment capabilities to the website and helped Summit move to a more cost-effective payment processor and banking relationship. Summit is significantly more competitive within the auto finance space. Summit now has a modern public website, a self-service customer-facing portal, and an admin portal where agents can better service customers. 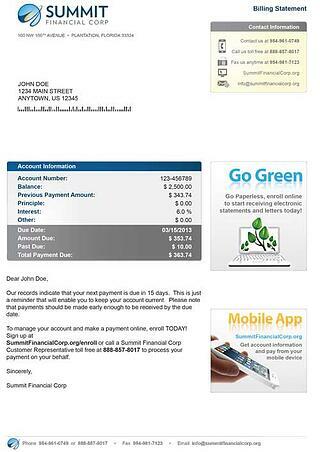 Summit customers can now enroll, manage their account, get payment alerts and notifications and make payments online. Summit agents can now focus on their primary responsibility: calling delinquent account holders to collect payment, rather than field inbound payment-related calls every day. This saves approximately 30% in call center hours. Compliance risk has been reduced because Summit employees now have standards in place for correspondence with a defined approval process for changes, and all communications readily available online. Print and mail costs have been reduced by 40% while supporting a larger customer base. More than 70% of Summit’s customers now do business with the company online, and virtually any correspondence, from statements to payment reminders, can be delivered electronically in real-time. Summit has seen a significant increase in customer satisfaction and a 30% decrease in inbound call volume to its call center. www.cedardoc.com.